Extrusion and Molding are the main two means by which the bricks are manufactured. The bricks produced by each method have similar characteristics but have differences that are noticeable. The main composition of bricks is clay or the shale mixed with suitable mixing agent like water so that together a required consistency is obtained for the modeling clay mix. The wet mix is forced and allowed to move through a standard die, which will impress the mix to a required shape. This will give us an extruded brick. The mold mix is provided through a molding chamber, which is called as the pug mill. This mix is allowed to pass through a die. If the required shape required is rectangular, the shape of the die will be rectangle. This conversion of mold into respective shape is through the continuous application of the pressure. The figure -1 below shows the process of converting the mold mix from the pug mill into a rectangular shape under pressure. This process is called as the extrusion and hence called as the extruded brick. The face of the extruded brick can be provided with special texture or coloring. The extruded column is later divided into adequate length, that will create individual brick. As both, the faces of the brick will have optional texturing or coloring, both the faces of the brick will be suitable for finished wall exposure. The top and the bottom face of the brick does not possess any kind of distinction. The figure-2 below shows the individual brick column of clay. 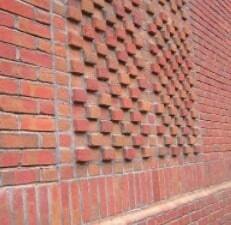 The figure-3 below shows different arrangement of bricks to bring different and attractive brick designs. 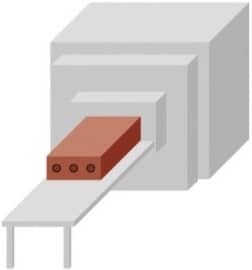 The manufactured extruded brick can be made with hollow spaces or they can be cored as shown in the figure-4. The bricks with holes throughout the brick is called as cored brick. These core bricks help in reducing the brick weight and the amount of the material used for the manufacture. 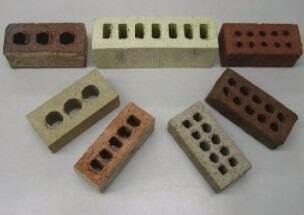 These types of brick also help in getting uniform firing and drying. They are economic in nature when it comes to their delivery cost. The presence of core help in having good bond and interlocking between the mortar and the brick. The number of cores in each brick and their respective sizes vary based on the specification required. Based on the combined surface area of the core present in the bricks that are manufactured, they can be classified as solid masonry unit and Hollow brick units. The bricks come under the category of Solid masonry unit if the net cross-sectional area of the brick that is parallel to the bedding area is greater than or equal to 75% of the gross cross-sectional area. This gross cross-sectional area is measured in the same plane. These comes under the category of Hollow brick if the combined surface area of the holes in the brick is greater than 25% of the total bed surface area of the brick. As mentioned above the cores in bricks help in reducing the unit weight of the material without compromising the structural capacity of the material. 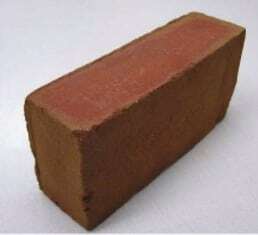 The most common core brick that is available in the market is 230mm x 110 mm x 76 mm with a standard weight of 3.09kg. These are used for the construction of the internal walls or as structures used for supporting. These core bricks can be used in combination with sound bricks together acting as common renders that are not load bearing. The strength provided by a solid brick wall and a cored brick wall does not bring any kind of variation. The cored brick walls have similar moisture penetration resistance as in the case of a solid bricks. But in the case of availability of the material, the most available brick type whether it be solid or cored brick. The placement of clay in a wooden form or a mold will give us wood mold brick. The wood mold brick does not have cores in it. These type of brick does not have any sort of distinction between the face side and their backside. But the top and the bottom side will possess some distinction. These differences are observed at the edges where some portion of the brick is protruded outwards. The top is normally flat with the mentioned edges protruding. Bu the bottom face is not as flat as the top surface. This distinction is observed in the figure – 5 below. While laying the brick in the mortar bed, either the top or the bottom surface can be used for laying. But normally the placement of the bottom layer on the mortar bed makes it easy for the mason to bring alignment horizontally and vertically correct. During the forming process of the wooden block brick, a recessed area is created on the bottom surface of the brick. This is called a frog. The frog for different bricks in varying sizes are shown in the figure-6 below. The presence of frog in bricks help in increasing the surface area. This in turn help in increasing the bond between the mortar and the brick. As per the Brick Industry Association Technical Notes, the bricks that are employed in the construction of the exterior walls are the Face Bricks. These bricks are classified into three grades namely the Grade SW, The grade MW and the Grade NW. These are bricks that are employed for temperatures that makes the bricks more susceptible to freeze and thaw. The walls that are exposed to temperatures below freezing can be constructed by this type of brick. These are applied for the construction of the interior walls that must be protected from the water absorption and freezing issues. Similarly, the Brick Industry Association also classifies the Paving brick into Grade SX, Grade MX and Grade NX. The wooden mold brick will have a sand finish texture. This is because sand is used as an releasing agent in the mold box. The wood mold brick is used in giving a traditional touch to the residential building. It improves the aesthetics of the exterior and the interior walls. A proper and well defined pointing works with these bricks help in giving a good finish wall without further painting or plastering works. It’s a good solution, otherwise you would need to paint facade regularly. Painting is quite a popular way to brighten up property, so if you are looking for a reliable contractor, learn more about Brushwork Painters.